Happy Pi Day everyone! Wait, what? Ah. Missed it. Well, sort of. You see, we were all ready for some Pi Day Magic this year. We’ve made an iPhone app (and we hope it will be available for other smartphones soon), but it was not approved in time. I win!… at failing. It’s a mathematical magic trick where your volunteer may choose any five cards from a deck. One card is then hidden, yet you can determine the volunteer’s hidden card from the other four. Are people really so predictable? Download the app now to find out how to perform this trick. Plus, all will be revealed in a future episode of Scam School with Brian Brushwood. Click here to read the reveal article by me (James Grime) for more on the Magic and Mathematics of this trick. Or click the video below to see how it’s done on this special episode Scam School with Brian Brushwood. You can still play along on Twitter, and now you can perform it for yourself on your friends! Yesterday was the start of our Pi Day Magic! We’ve had a thousand participants so far from all over the world – despite the Twitter-Crash which lasted about 7 hours right in the middle of the event. I have aged 20 years in the last 24hours! 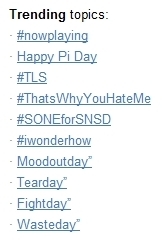 Amazingly ‘Happy Pi Day’ was a trending topic worldwide. You geeky people. And you can still play! We’re busy people, we can’t reply to you all individually, but we’ve written a script that will reply and tell you the number of which you were thinking – it’s that clever. To play just follow the instructions here on the website, and send your digits using the hashtag #pidaymagic as before. We will keep it running all week. And check back at pidaymagic.com tomorrow when we will reveal how we did it, and you will be able to perform this trick yourselves on your family and friends. We will release an episode of Scam School explaining how you can pull this trick off, as well as an article by myself explaining the magic and the mathematics of the Pi Day Magic event. Thanks go out to my partner in this event Brian Brushwood (@shwood), as well as massive thanks to Brian Pollock (@cloudoidltd) – whose idea this was, and Dave Wagner (@kaeladan) – codemonkey, master of the Dave Fu. Special thanks to Simon Singh (@SLSingh), Marcus du Sautoy (@marcusdusautoy), Richard Wiseman (@richardwiseman), the Times Higher Education Supplement (@Timeshighered) , Mismag822 (youtube/mismag822), Cambridge Science Festival (@camscience) and to everyone who retweeted and spread the word about Pi Day Magic yesterday! Thanks to Twitter for their help with the event. 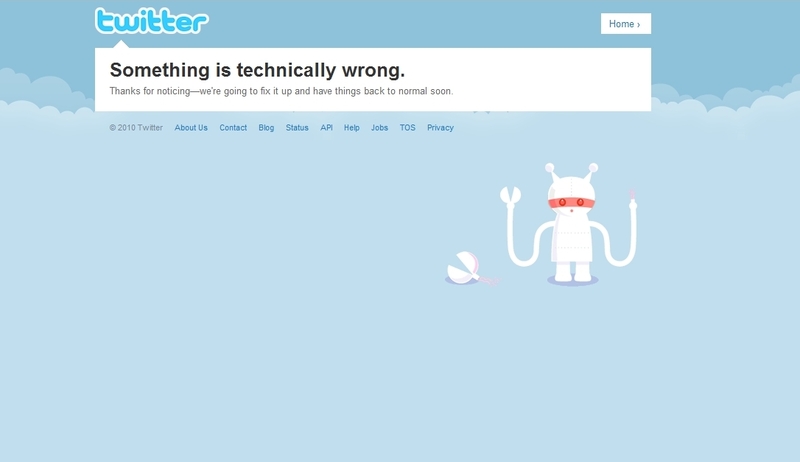 Curses to Twitter for the crash. And finally thanks to everyone who participated! First, you will need to follow both of us (@jamesgrime and @shwood) In order for us to send you a direct message. This will not work if you don’t help us and join in. If it doesn’t work for you tell us. If it does works tell everyone! And be honest. Finally, if you think you know how this trick works remember the magician’s code and do not reveal the secret. 1. We want you to start multiplying random single digit numbers, for example 3 x 7 x 8 x 4 x… Mix it up and keep going until the result is a large number in the millions. Then stop. 2. There is no way for us to know what number you have just made. Now pick one of those digits, and keep it to yourself. This is your chosen digit. 3. Now we want you to tweet the remaining digits of your six or seven digit number – in any order! Everything but your chosen digit. 4. Remember there is no way for us to know the number you made. Or the number you chose. Now concentrate on your chosen digit. New promo video for Pi Day Magic, with extra webcam goodness. For one day only, one mathematician and one magician will join forces to perform what we believe will be the world’s largest live online magic trick, and you can join in!